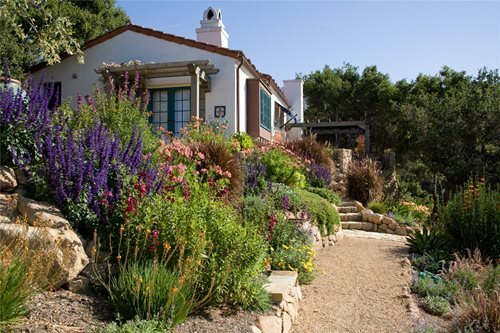 After a close call in 2008, the owners of this property requested that their garden be fire-safe and drought-tolerant. Succulents and other fire-resistant plants were used near the home to comply with Cal Fire's lean, clean and green regulation. Stock tanks keep pests from destroying vegetable crops. Crushed gravel paths wind through the colorful hillside garden. 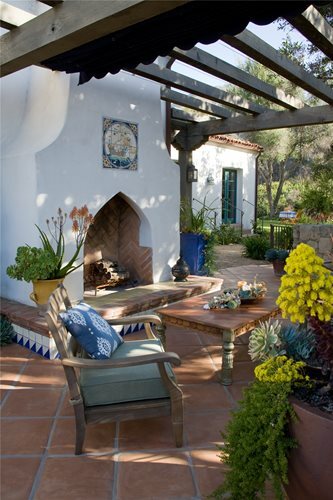 The owners viewed the fire as a chance to create a garden that better suits their lifestyle. 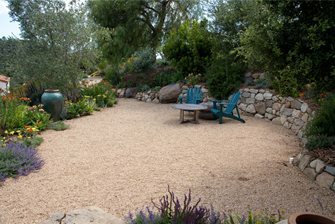 Dry stacked stone walls were used to terrace the hillside and create usable space such as this patio. The gravel walks and patios also serve as fire breaks. A cedar spool, which is bigger than a spa, but smaller than a pool, provides a place to cool off and an emergency supply of water. Native plants were used to create a meadow on part of the property. How the gardens looked in 2008 after being virtually destroyed by wildfire. It's hard to believe that less than four years ago this thriving landscape was a plot of bare, scorched earth. 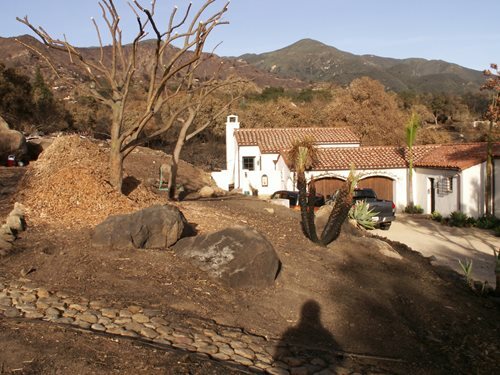 In November of 2008 the Santa Barbara Tea Fire raged through the small valley where this home is located. While the house was spared, the gardens surrounding it were essentially destroyed, leaving the owners wondering if they should stay or go. Enter Margie Grace, of Grace Design Associates, a woman whose official title is landscape designer, but who also assumed the role of restorer and protector on this project. 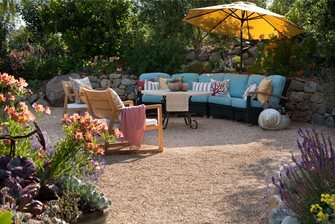 Through her work she lifted the homeowner's spirits by creating a beautiful fire-safe landscape that offers peace-of-mind and enjoyment. RestorationWhen Grace first arrived at this property the scene was quite bleak. Most of the vegetation had been thoroughly burned or badly damaged by the extreme heat. 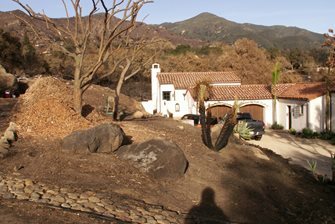 A few oak, sycamore, pepper and olive trees, as well as some pre-existing hardscape managed to survive the flames. Looking on the positive side, the homeowners chose to view this as an opportunity to tailor the gardens to their way of life. 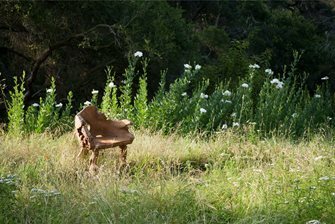 "They had only lived in the house a few months and felt that they had not made the garden their own," says Grace. In order to develop a design, she then spent time getting to know what the clients were looking for in their new garden and what the site would allow. With burnt, bare hillsides and an approaching rainy season, time was of the essence. Wanting to avoid any erosion or slippage, Grace addressed the most vulnerable slopes first. Dry stacked stone walls were built to terrace areas that would be used as patios. Additionally, plants with extensive root systems were used to provide erosion control in steep areas that had been denuded by the fire. Pro Tip: When growing plants on a hillside use drip irrigation with a slow application rate and create planting wells at the base of plants. The goal is to give the water enough time to penetrate to the roots instead of running wastefully down the hillside. Protection"In the situation of a wildfire, you want the trucks to stage at your house," says Grace. When the fire department selects a home as their base, this means that it is the safest house around. In order to improve the fire safety of this property Grace addressed three issues: reducing the amount of combustible fuel, increasing access and providing a convenient water source. The homeowner had requested plants with vivid color, specifically she wanted orange blooms. "Sometimes such a colorful garden doesn't sit well in the bigger setting," says Grace, "but this property is so secluded, basically tucked away in its own little world, that it works." She suggests using a color wheel approach to select shades that will complement each other, saying that opposites are a safe bet. The bright blooms in this garden also provide high habitat value and encourage pollination. Use this infographic to learn how to use color to set the mood in your landscape (PDF). In order to decrease the property's fuel load Grace focused on creating defensible space and using fire-resistant plants. "Cal Fire requires 30 feet of lean, clean and green space directly around a home," she explains. This ensures that there isn't highly combustible tinder under the eaves. Grace Design Associates increased the amount of hardscape near the house by installing new patios and walks made of native sandstone, gravel, decomposed granite and flagstone. 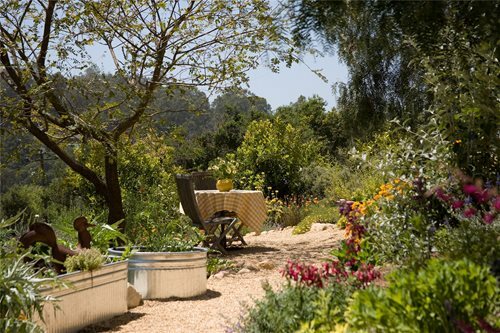 These patios and walks create space between plantings which reduces the chance that fire will spread. 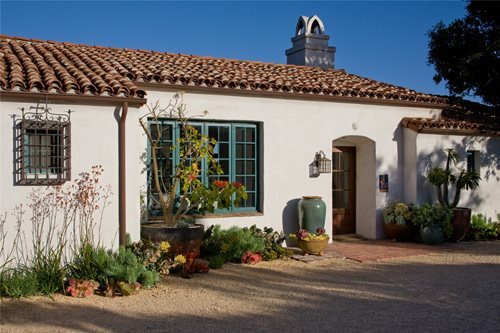 Container groupings planted with succulents were used to add life and color near the house. 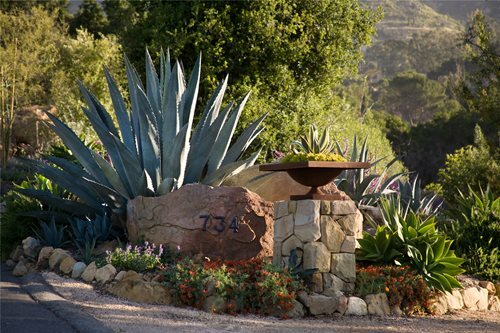 "We used succulents because of their rich color composition, low fuel load and rich moisture content," notes Grace. Plants on the rest of the property were also selected for their fire-resistant qualities. These qualities include the ability to store water, extensive root systems, limited production of dead material, high levels of salt, ability to withstand drought, low levels of oils or resins, and the ability to resprout after a fire. Pro Tip: When in a fire hazard area, check your plant selections against a list from your local fire department, such as the High Fire Hazard Area - Desirable Plant List from the Santa Barbara Fire Department. On this project Grace used containers to add color and height near the home. Check out her container gardening tips to learn how she creates stunning groupings. Another aspect of fire safety is access. "Fire trucks must be able to get in close to your home and turn around easily," Grace points out. Solving the access problem involved increasing the size of the gravel motor court by 25%. Now the gravel drive is wide enough that it also serves as a fire break. The larger area also permitted more design flexibility. "Increasing the size of the motor court allowed us to create a more generous entryway by extending the front stoop with bricks salvaged from on site," says Grace. Having an accessible water source greatly increases a home's fire safety. 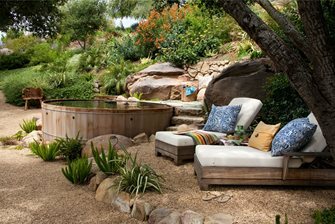 While a full-sized in-ground pool was not an option because of the steep terrain, a small body of water for taking a quick dip was appealing to the homeowners. Grace elected to install a cedar spool. "It's bigger than a spa and smaller than a pool," she explains. Measuring 10' by 12', the new spool holds twice the water of the hot tub that was burned in the fire and has a gas powered pump and hoses which firefighters can quickly hook up to. "I selected the cedar tub for its site-appropriate, natural appearance, its ability to flex with minor shifts of the slope and the fact that it would not require extensive engineering to install," she says. The spool was sited where the hot tub once sat, against a backdrop of stone and boulders that support the hillside. A pair of wooden chaise lounges with white cushions and colorful pillows, along with variegated flax and asparagus fern create a tropical atmosphere around the spool. 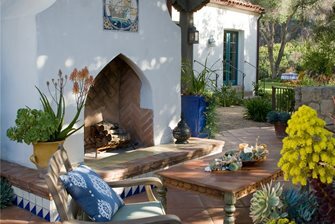 In the end, Grace Design Associates provided these Santa Barbara area residents with more than just a beautiful garden. Ultimately they gave them a place they could call their own and feel safe in, a place full off life and color, a place that fits into its larger setting and a place that demonstrates the resiliency of the land and of the human spirit. View this project's plan: Fire Safe Garden Sketch.